London mayor Sadiq Khan has denounced Westminster Council for blocking a proposal to pedestrianise Oxford Street. The local council has ruled out the possibility of transforming the major shopping thoroughfare into a traffic-free zone, citing a lack of community support. Khan, who pledged to deliver the project when he ran for office, has branded the decision as "a real threat to the future of Oxford Street". "This will be seen as a betrayal of the millions of Londoners and visitors to our city who would have benefited from making Oxford Street a safer, healthier and better environment," he said. Plans to transform the retail-destination road into a pedestrian zone filled with art were announced last year, with traffic restrictions due to be enforced by the end of 2018. The plans involved bringing roads up to pavement level, for better wheelchair accessibility, and re-routing buses, to cut down emissions on what is one of the most polluted roads in Europe. The council has defended its decision to withdraw support for the plan. Council leader Nickie Aiken said she could only support a proposal if "everyone can benefit from improvements, not just certain groups". "I utterly reject any suggestion that there is any kind of betrayal," responded Aiken. "Quite the contrary, we are sticking up for the people who know best, those who live and work in the district." The idea of pedestrianising Oxford Street has been in discussion for years, as a result of overcrowding and frequent traffic accidents. Zaha Hadid Architects is one of the various studios to develop a vision for it. 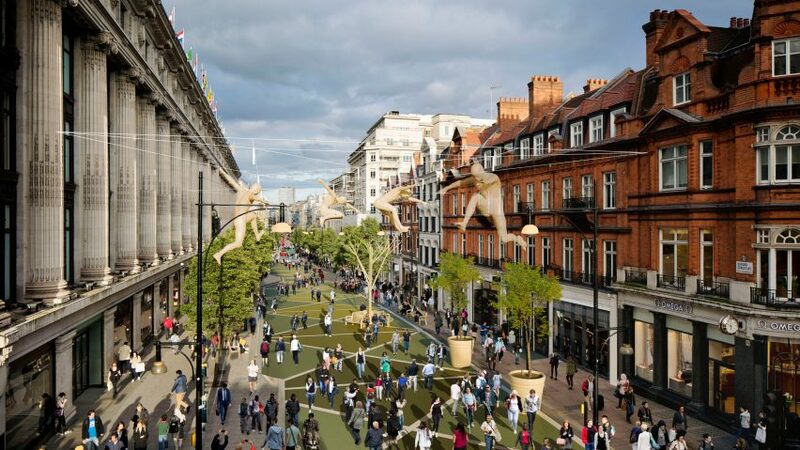 The first stage of Khan's proposal was to pedestrianise the stretch to the west of Oxford Circus, filling the street with plazas, benches, and an 800-metre artwork. This was due to be followed in 2019 by the pedestrianisation of the eastern section culminating at Tottenham Court Road, while the final section near Marble Arch was to be converted by 2020. Over a million people were reportedly contacted in the consultation process. Of the 14,377 respondents, 9,000 people either fully supported the project or had only "some" concerns. However Westminster Council insisted local residents were unimpressed by the concept. It suggested that, with cars and bus routes diverted, additional vehicle traffic pressure would be placed on nearby side streets by the plans. Aiken is now calling for a "rethink of the whole strategy". But also conceded that doing nothing "is not an option either". Questions are now being raised over how Oxford Street will cope with the increased number of pedestrians when Crossrail, a new high-speed train link under London, opens at the end of 2018. The £14.8 billion Elizabeth Line will shuttle an estimated 200 million passengers across the city each year. One of the new stations is at Tottenham Court Road, so would have directly connected with the pedestrianised area. Scrapping pedestrianisation could also impact other projects in the pipeline in London's West End. Property developer Derwent London recently acquired 285,000 square feet of land on the corner of Oxford Street and has planning permission to turn it into a mixed-use pedestrian area. Enabling works have already started on Soho Place W1, which will include offices, retail and a new theatre. Derwent London declined Dezeen's request for comment on the news. Also, Richard Seifert's heritage-listed Centre Point tower was recently converted into apartments, which will be accompanied by a new public square.